On the face of it the Scotty Cameron Newport 2.5 Center Shaft looks like a standard Newport style head with all the hallmarks of a Cameron design. Great appearance combining softness with modern lines. But hang on a minute. The shaft goes into the head at a slightly odd point (much closer to the center of the head than you'd imagine), and it's straight, not kinked. This is no ordinary Newport 2. Obviously whether you're going to like this look or not is a question of taste. I found that the closeness of the shaft insert point to the aimline (and therefore the ball at address) gave me a positive feeling of control. On the downside, the straight shaft hides the heel of the putter when you address the ball and this can make alignment more difficult. Added to that the putter looked ... well ... like a bit of a mutant. There's a dot where the hosel would normally attach to the head, but it's not there. So is this slightly ugly duckling any good? Well, let me see now. I think there's only one word for the Scotty Cameron Newport 2.5 Center Shaft: A revelation! The feeling of stability through impact is about as good as I've ever experienced. Ten minutes with this putter and I was sold. The face felt as though nothing could make it twist or knock it off course through it's swing. 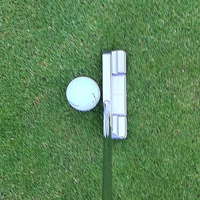 This all comes in addition to the soft-but-assertive feel that Scotty Cameron's putters all have. No quibbles here. The roll is excellent. Just what you'd expect from a Scotty. A supreme delight of a putter. Centre shaft seems to add plenty to the legendary Newport head and the only drawback is that you can't see the whole of the top edge of the putter.